Vodafone and Blue Reach, the wireless subsidiary of CallPlus, have traded blocks of spectrum in the 2.5GHz spectrum band. The trade will allow both carriers to operate Long Term Evolution (LTE) networks using standard frequencies supported by hundreds of phones and broadband access devices on the market today. Although not yet announced or reported by either company, the swap was recently registered in the Ministry of Economic Development’s SMART database, with commencement of the change 30 May 2012. 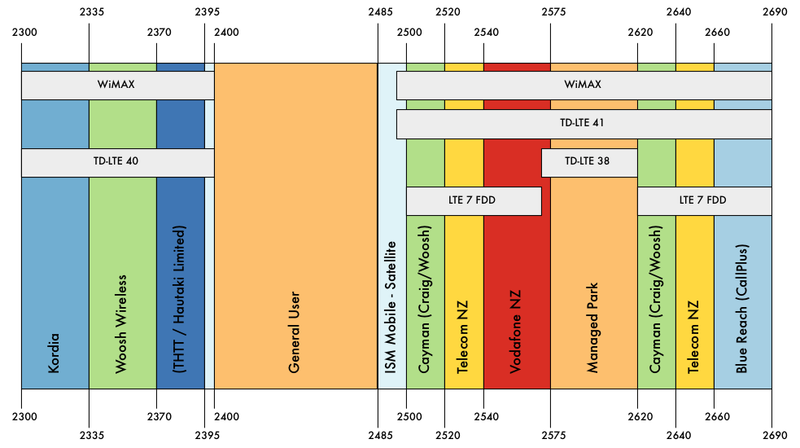 Just nine days before this license change, NZTelco commented on unusual activity in Vodafone’s 2.5GHz spectrum band, and speculated on what Vodafone might be doing. A spectrum swap was not foreseen or discussed. Prior to the spectrum swap, Vodafone and CallPlus each held single blocks of spectrum suitable for use with Time Division Duplex (TDD) WiMAX or LTE band 41, a recently ratified band for which no base stations or mass market devices are yet produced. CallPlus had been operating a WiMAX network using their spectrum in Auckland, and Vodafone had not used their spectrum for anything. 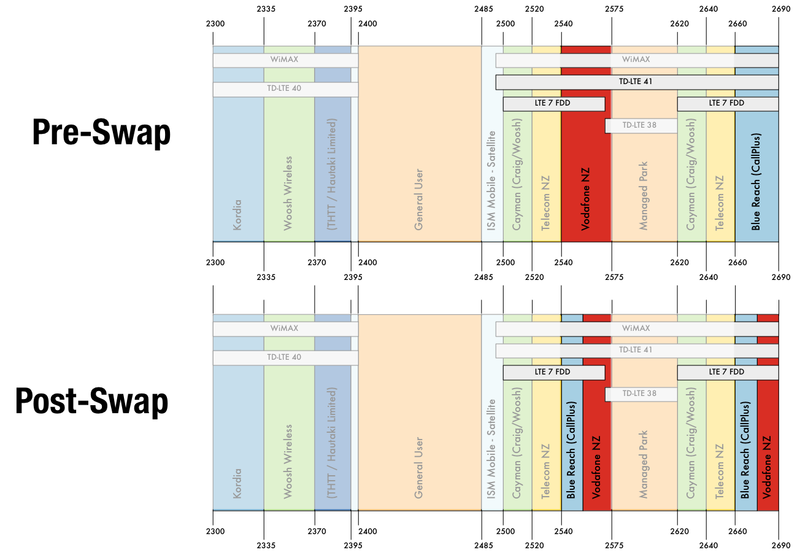 The diagrams below show a “before and after” picture of the 2.3 & 2.5GHz spectrum bands and how they were affected. Since the swap, both providers now have 15MHz pairs in LTE Band 7, a key band for offloading data traffic in congested urban environments. The utility of such spectrum is immense, especially to Vodafone, who have a higher user to deployed capacity ratio than either Telecom or 2Degrees Mobile. 2.5GHz spectrum has very small cell sizes, high capacity, and high potential for re-use. It is likely to be used in the most crowded of locations to take pressure off of Vodafone’s network in areas of peak demand. The alignment of the spectrum with an internationally supported band is also important. 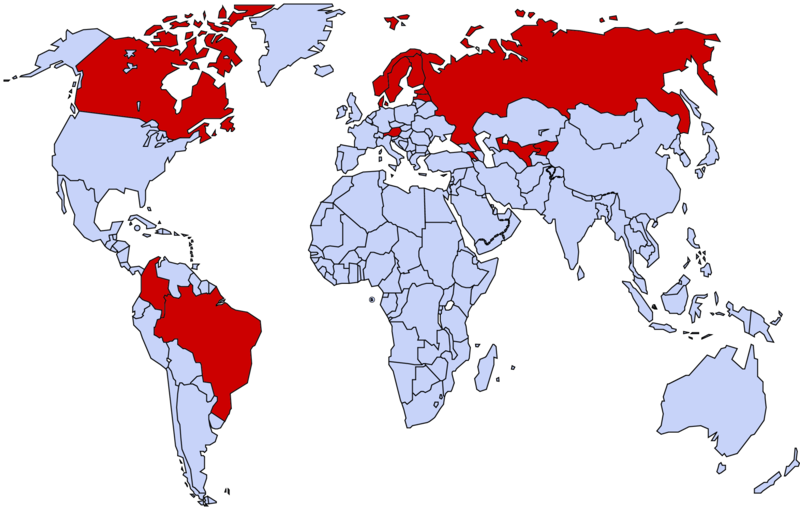 The map below shows countries where LTE Band 7 networks are active today. With a 2.5GHz LTE network Vodafone could offer lucrative LTE data roaming services to users from these countries. Band 7 is likely to be the most common band for in-home and in-office LTE Femtocells, and is today the best choice for providing LTE to crowded locations like train stations, conference rooms, and sports stadiums. Vodafone’s spectrum swap with CallPlus can only mean good things for its customers. On the 21st of May, the Commerce Commission published a draft report on their demand side study of high speed broadband. One of the more interesting bits has to do with the connection of houses to the Ultrafast Broadband (UFB) network. The sharp negotiators at Chorus managed to strike a last mile UFB deal with the Ministry of Economic Development that’s twice as good for suburban areas as the Local Fibre Companies Ultrafast Fibre, Enable, or Northpower received. This has implications for uptake, as retail Internet Service Providers marketing UFB products who will have a higher upfront cost for adding UFB subscribers to the Chorus network than they will for other networks. What’s going on with Vodafone’s 2.5GHz spectrum? Universal Access is the concept of providing every person a reasonable means of access to publicly available telecommunications. (ITU) This could be by payphones, community centers, computer rooms at schools, or free wifi hotspots. Across all countries in the OECD, New Zealand is unique in its problems of connectivity to the outside world. A single modern cable system links the country to the outside world. Australia, further away from the United States and its wealth of content, connects to the world via New Zealand, Guam, Papua New Guinea, and Indonesia. Iceland, alone in the Norwegian sea, connects to the world via Canada, Ireland, the UK, and Denmark. Around ten thousand of New Zealand’s most remote households connect to the public switched telephony network (PSTN) via customer multi-access radio (CMAR). Although copper loops connect up these neighborhoods of between ten and sixty houses, the loops are disconnected from major fibre optic backbones because of the cost of running cable across rough territory. These systems provide excellent voice service, but data service is limited to 14,400 bits per second – or around 0.1% of the capacity of a modern ADSL connection. In the recent demerger of Telecom New Zealand, the CMAR network has gone to Chorus, as indicated the Asset Allocation Plan (PDF). The diagram below illustrates a typical CMAR topology. It shows a local copper loop linking houses, an outstation linking the loop to a radio tower, and a radio linking network connecting the system back in to a regional centre with fibre optic network access.